The best part about writing a blog is when people take the time to let you know that they have enjoyed what you have written. Last week, I was delighted to receive an email from Susan Ardelie, author of the Life Takes Lemons blog, thanking me for my blog and nominating me for the One Lovely Blog Award. What a wonderful way to encourage others! 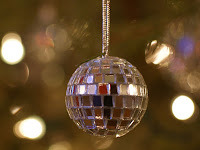 It is all too easy to criticise rather than praise, so I am taking this opportunity to encourage other bloggers, which is particularly appropriate during this season of goodwill. 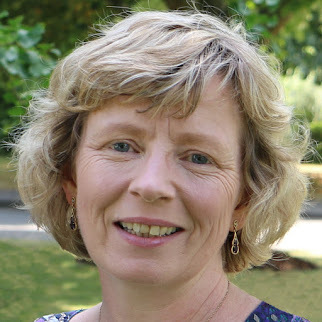 So, thank you, Susan, for nominating me – I hope you continue to enjoy my blog for a long time to come and that this post will encourage others as much as you have encouraged me. 1. My favourite book is Jane Austen’s Pride and Prejudice, and for me, the BBC dramatization with Colin Firth and Jennifer Ehle is the best adaptation ever. 2. I used to live in Alton, Hampshire, near to Chawton where Jane Austen once lived. 3. 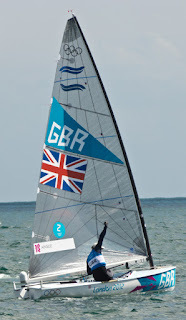 Now I live by the sea (which I love) in Weymouth, Dorset, where George III visited almost every year from 1789 to 1805. 4. I started researching my family tree when I was thirteen and have since discovered ancestors who lived in the 1700s. 5. When I was at school, I played the part of Josephine in the Gilbert and Sullivan operetta, the Pirates of Penzance. 6. I graduated from university the day before I got married. 7. Every Christmas I watch Scrooged (a 1980s film based on A Christmas Carol by Charles Dickens) starring Bill Murray and Karen Allen. 1. 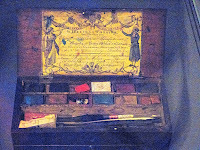 The Regency World of Author Lesley-Anne McLeod – lots of wonderful information about the Regency period, including a post (on 14 December) with puzzles from 1809-14 to tease your brain. 2. Georgian Gentleman by Mike Rendell – includes a wealth of original material from his ancestor, Richard Hall. 3. Laura Purcell - a blog by a lady in love with the Georgians. 4. 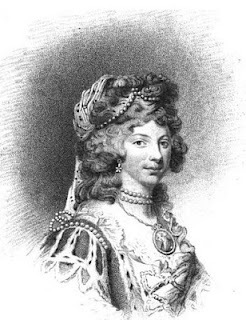 Regina Jeffers – includes entries from a Regency era lexicon. 5. 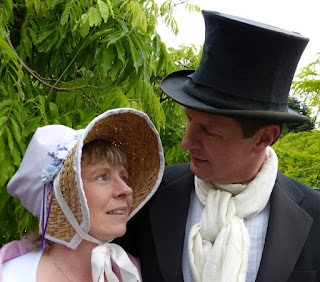 Austen only – everything about Jane Austen. Definitely one to keep an eye on with the 200th anniversary of Pride and Prejudice coming up next year. 6. Word Wenches – lots of fascinating historical posts. 7. 30daybooks by Laura Pepper Wu – a blog full of advice on writing and publishing. 2. 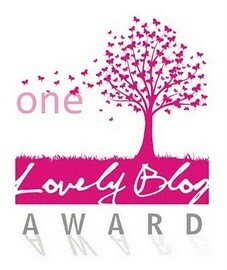 Add the One Lovely Blog Award image to your post. 3. Share seven things about you. 4. Nominate seven blogs for the award. 6. Let the writers of your nominated blogs know. Did they have Christmas trees in the Regency? 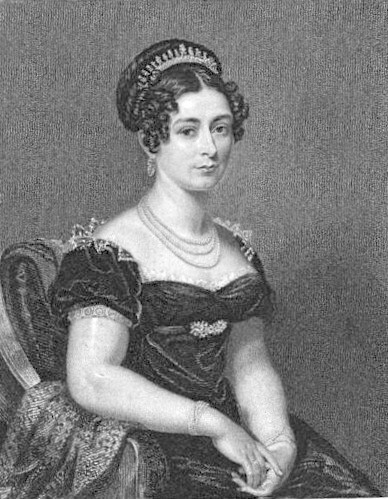 With the approach of Christmas, I decided to do a little research into what a Regency Christmas might have been like. I knew there were Christmas trees in Victorian times, but did they have Christmas trees in the Regency, and if so, were they the same as those we have today? It was back in 1800, more than a decade before the Regency began, that I found the earliest reference to a yew tree being used in Christmas celebrations. The Christmas custom of taking a tree inside your house and decorating it was well-established throughout the German states, and Queen Charlotte, who came from the German duchy of Mecklenburg-Strelitz, introduced this tradition to England. It is interesting to note that the tree stood in an “immense tub” in the middle of the room, presumably on the floor; all the other references that I found talk about table-top Christmas trees. However, Christmas trees did not become fashionable in Victorian England until after the Illustrated London News printed an engraving of Queen Victoria, Prince Albert and their family gathered around their Christmas tree at Windsor in 1848. 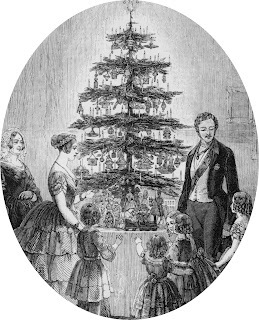 This has led to some people wrongly attributing the introduction of Christmas trees to Prince Albert, whereas, as we have seen, they were already well-established in the Christmas celebrations of the royal family by this time. But did anyone outside of the royal family have Christmas trees before their widespread popularity after 1848? It would seem that some people did, especially those with German connections of their own. Charles Greville, who stayed with the Cowpers at Panshanger for Christmas 1829, described the Christmas celebrations there in his diary. Princess Lieven, one of the patronesses of Almack’s, was also staying there. So, did they have Christmas trees in the Regency? The royal family did, from at least 1800, and some people copied the royal tradition. Also, other families connected with Germany may have brought the Christmas tree custom to England by that time, quite independent of the royal family. However, it would appear that Christmas trees as we know them were not popular until after 1848, and that many of the trees that people had were smaller and placed on tables rather than the floor. 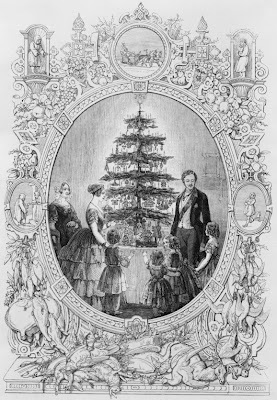 If you know any more about Christmas trees in the Regency, please let me know by leaving a comment. (1) I am indebted to Matthew Ward, a descendant of the Duke of Portland, for this information. The Duke of Portland's papers are held at the University of Nottingham. Christmas approaching, every absent child feels anxious to receive the customary favours of their indulgent Parents. During this inclement, but auspicious season, what could be more acceptable than a pair of MARSTON’S PATENT STAYS or CORSETS, which are admirably well calculated to improve the shape, and comfort and support the weak and debilitated; and which are selling at the OLD PRICES, notwithstanding the exorbitant charge for materials: warranted to be manufactured by the first hands in the business and in the most elegant and fashionable style, full TWENTY-FIVE PER CENT under the regular trade price. Genteel rooms for Ladies to try on. 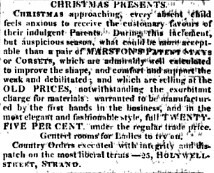 The advert suggests that, whether your parents are “weak and debilitated” or “elegant and fashionable”, “a pair of Marston’s patent stays or corsets” would be a most acceptable gift! What an unusual idea for a Christmas present for your parents! 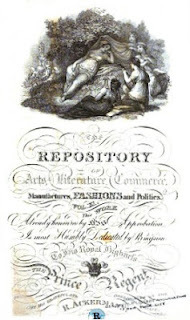 I assume that the January 1814 issue must have been available in December or otherwise that the advertisement was submitted late.